Romblon still had more surprises. After climbing down from Fort San Andres, I proceeded to the Romblon Shopping Center to shop for marble souvenirs. But since I was starving, I had some halo-halo in one of the carinderia in front. As soon the shopping was done (since I still had to return to Tablas, I had to shop wisely or face the problem of carrying a heavy load), I returned to the hotel to get some rest before dinner. I was resigned to the fact that I had no choice but to pick another of the usual turo-turo at the Romblon Shopping Center. 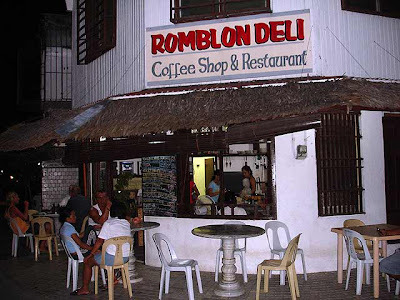 But I decided to walk around a bit and remembered passing by a cafe called the Romblon Deli from the pier. And I easily spotted it a few meters away from Freedom Park. Who could imagine that this laidback town of Romblon would have restaurants serving international cuisine? 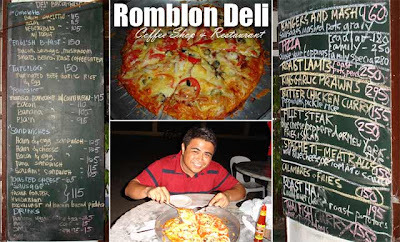 Indeed, Romblon Deli Coffee Shop & Restaurant was a bold experiment as the owner Dave Kershaw explained to me. 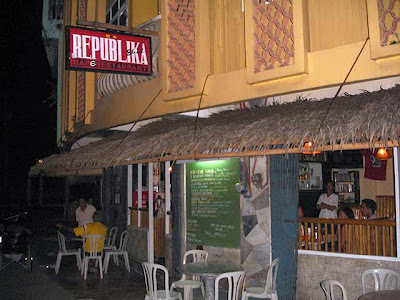 There are two such restaurants in fact located beside each other, the other being Republika Bar & Restaurant (formerly Jack’s Restaurant which Dave sold to his friend three years ago). The items in the menu are chalked up on a black board and change every now and then. Most of the perishable ingredients are imported such as the steaks, lamb and cheeses, brought to Romblon via a complicated supply chain from Manila, Batangas and Puerto Galera. The dry ingredients are sourced locally. The restaurant was established to cater to up market visitors, hoping to pull in the “right” kind of tourists. Most of the clientele that night were foreigners many of whom were working as volunteers in Romblon. But there were the occasional locals. 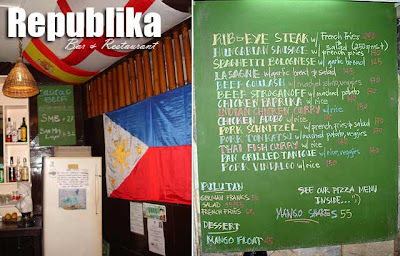 Though the selection is quite pricey for most locals, imagine getting steak for PHP250. Not bad at all! For the night, I got myself a medium deli pizza topped with salami, olives, onion, tomatoes and bell pepper just for PHP200. Menu includes deli pizza (depending on size between PHP180 to PHP280), fillet steak (blue cheese, peppered or New York style with fries and salad at PHP250), bangers and mash (PHP160), roast lamb with toast, potatoes and peas (PHP250), and sandwiches (from PHP105 to PHP125). Check out their rib-eye steak with French fries (PHP250), beef goulash with mashed potatoes and veggies (PHP170), pork schnitzel with fries and salad (PHP170), and chicken paprika with rice (PHP140). waw! nkakatuwa nmang makita yan. been there countless times in freedom park. The priest assigned in St. Joseph Cathedral is my uncle. Every vacation dian kmi sa kumbento nag-sstay. I'm currently here in Odiongan, handling our business. Have you visited Punta Corazon, Suwa beach, San Pedro beach in Romblon? How about the Dam in Magdiwang Romblon, the Lambingan falls and the Cantingas all found in Sibuyan Island. Ganda, pramis. Great blog. I am soon going to visit Romblon and the Visayas in order to update the Visayas section of the Lonely Planet guide. If you or any of your readers have any "must sees" for the Visayas please let me know. You can add suggestions to this post here. Look forward to hearing from you! Romblon is great great place especially for the historian and traveler. You will experience the life away from the city. the beauty of carabao island. Excellent information, well done. I know because I live here! You should visit Banton. You'll be amazed of its hidden cultural treasures: their unique language, traditions, legends, old houses, the Church, and of course their stones. Surnames starting with "F" comes from this place! Unlike in Romblon, Romblon where "M" dominates and "R" & "S" in Sibuyan Island.